Be the first to share your favorite memory, photo or story of Michelle . This memorial page is dedicated for family, friends and future generations to celebrate the life of their loved one. 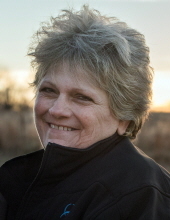 Michelle "Shelly" Laree Rheam, age 62, of Ponca City, Oklahoma, passed away April 11, 2019, in Tulsa, Oklahoma. A celebration of her life will be held on Wednesday April 17, 2019, at 10 a.m. at the Trout Funeral Home Chapel with Shane Hickey officiating. Michelle will be laid to rest at Resthaven Memorial Park following the service. Michelle was born on April 17, 1956, in Ponca City, to George "Gus" Ehler and Marilyn (Andrews) Ehler DeNoya. Michelle grew up in Ponca City. She married Max A. Rheam in Ponca City on October 14, 1983. She worked as an Office Manager at Thompson Oil Co. Michelle was very involved with and volunteered with the American Legion and was a member of the Moose Lodge. She loved Bingo, horses and drag racing; having once owned a race car with her husband, Max. She was an excellent gardener and landscaper. Family was very important to her and she met her mother and sister, Teresa for coffee every Wednesday. Her family described her as a very giving person who was also a "cleaning fanatic". Survivors include her mother, Marilyn DeNoya of Ponca City, OK; daughter, Laura Travis and her husband Chris of Wichita, KS; son, Chase Rheam of Stillwater, OK; grandchildren, Tucker and Kate Travis of Wichita, KS; sister, Teresa Spires and her husband Bill of Marland, OK; brother, Mitchell Ehler and his wife Jo of Owasso, OK; half-brother, Michael Ehler and his wife Valerie of Ponca City, OK, step-brother, Brandon Ehler of Newkirk, OK; uncle, Jerry Andrews and his wife Bette of Plano, TX; cat, Miss Kitty, dog, Zipper, and numerous nieces, nephews and other family members. She was preceded in death by her husband, Max A. Rheam; father, George Ehler; and uncles, Mack Andrews and Emmett "Rusty" Andrews. Casket bearers will be Steven Bradley, Mason Combes, Scott Cunningham, Michael Coffman, Irvin Lee Wright, Greg Hunter, Harland McClaskey, Bill Correll and Jay Goff. Honorary casket bearers will be Terry Thompson and Bob Weatherly. To send flowers or a remembrance gift to the family of Michelle "Shelly" Rheam, please visit our Tribute Store. "Email Address" would like to share the life celebration of Michelle "Shelly" Rheam. Click on the "link" to go to share a favorite memory or leave a condolence message for the family.